A marvelous canyon created by water erosion. There are many slot canyons in Northern Arizona and Utah. One of the most famous slot canyons known worldwide is Antelope Canyon 3 miles north east of Page Arizona located on the LeChee Chapter of Navajo Nation Land. Created by water and wind over millions of years the twisting narrow sandstone corridors open into chambers of ethereal beauty. Many Navajo people believe entering Antelope Canyon is a spiritual experience as entering a sacred place of worship and leave with the wondrous feelings of the beauty of Mother Nature. Here is what you need to know to experience Antelope Canyon for yourself. First, all visitors to both the upper and lower canyons must be accompanied by a Navajo Guide. You may sign up with one of the four authorized tour companies in Page Arizona or you may drive out to Antelope Canyon yourself, pay admission and sign up for a tour at the entrance. From Page take Hwy 89S approximately 2 miles until it intersects with Hwy 98 E. Drive about a mile on Hwy 98 and you will see the dirt parking lots on two sides of the highway. The upper canyon is on the right and the lower canyon on the left hand side of the highway. The upper canyon is at a higher elevation and accessible by 4 wheel drive tours. The upper canyon tour is approximately 1 1/2 hours over mostly flat terrain. When the sun is directly overhead beams of sunlight radiate from openings at the top of the nearly vertical walls and move across the chambers in rich shades of color from red to orange to purple. The lower canyon is a walking tour of approximately 1 hour in length. Metal stairways are fixed to the sandstone allowing you to descend to the twisting narrow floor of the canyon commonly referred to as a corkscrew. Some passages are very narrow and footing is not always solid and level. If you choose to tour the lower canyon you will be rewarded with fewer tourists. 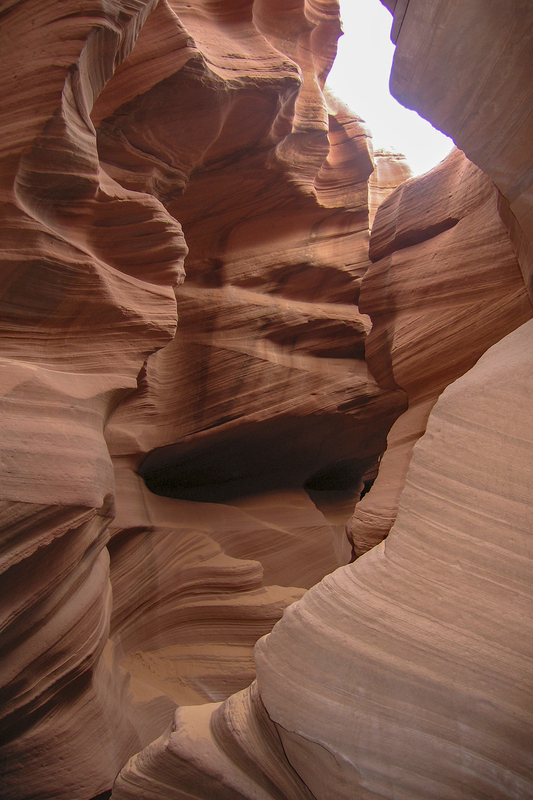 Many people tour both the lower and the upper canyons on two separate tours. Photography tours of approximately 2 1/2 hours are available. Although not a photography workshop a guide will point out highlights of the canyon and help you find composition areas. Tip: The entrance gate is open from 8AM-5PM Mountain Daylight Time every day of the week. The last tour departs around 4PM. Arizona with the exception of Navajo Nation Land does not observe daylight savings time so it will be 1 hour later at the canyon. Warning: Slot canyons experience frequent flash floods. If your guide advises you not to enter the canyon or to immediately exit due to storms in the area follow his directions without question. It does not have to be raining at the canyon for flash flooding to occur. This entry was posted in Glen Canyon, National Parks and tagged Antelope Canyon, Glen Canyon National Recreation Area, Navajo Nation Land, Page Arizona, slot canyon, Southern Utah. Bookmark the permalink. Antelope Canyon looks so beautiful!!! Love the smooth rock and color. Great pic!!! Beautiful photos. My hubby and I are planning a trip to hike Utah very soon. We were looking at the Moab area….. looks like we’ll have plenty of options!